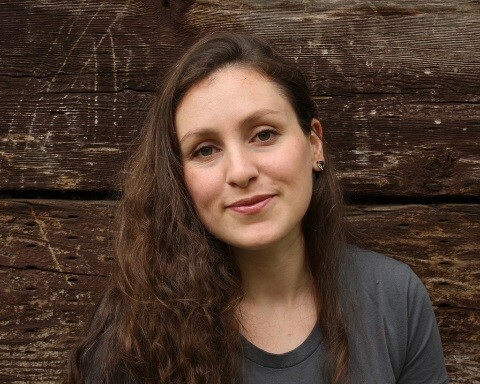 Haliburton, ON (May 7, 2018) – Fleming College is pleased to announce Andrea Kastner as its 2018 Reclaim Artist in Residence. Kastner is a painter based in Binghamton, New York. She received her BFA from Mount Allison University in New Brunswick, and her MFA from the University of Alberta. Kastner’s work has been shown in galleries across Canada, including solo shows at Harcourt House (Edmonton), the Kamloops Art Gallery, and ODD Gallery (Dawson City), and group shows at the Art Gallery of Hamilton, the Esker Foundation (Calgary) and the Art Gallery of Windsor. She has received grants from the Elizabeth Greenshields foundation, the BC Arts Council, the Ontario Arts council and the Canada Council for the Arts. 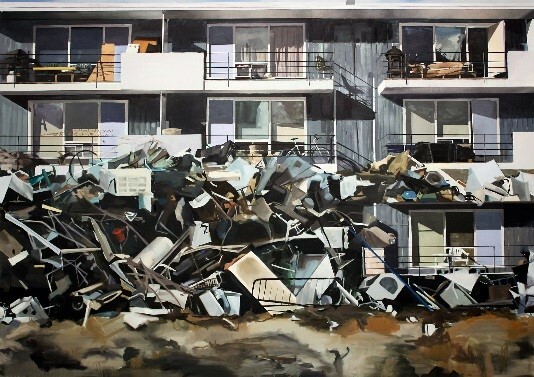 She has participated in residencies at the University of Windsor, the Banff Centre for the Arts and the Vermont Studio Center, and was a finalist for the RBC Canadian Painting Competition in 2012. Working at a waste site might be an unusual dream, but it has been Kastner’s for a very long time. She began dragging bags of garbage into her studio when she was a student at the University of Alberta in 2010 and has been fascinated by trash ever since. She loves learning about people’s relationship to things, what we want to keep and what we throw away. For Kastner, it is like being an archaeologist or detective, looking at our waste systems for clues about what we care about as a society. 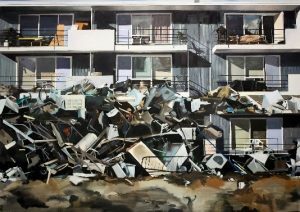 As a painter she is drawn to the aesthetics the landfill, which exist as a shadow city accidentally erected away from the places we live. She is very excited to spend time in Haliburton this summer. “I can’t wait to see what I learn from the community in Haliburton. 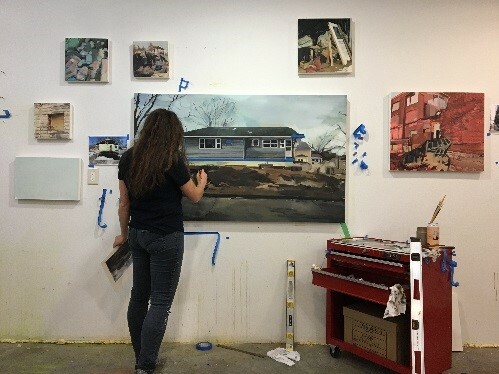 I look forward to speaking with people at the school, the landfill and the town while I bike back and forth between the site and the studio, and make a new series of paintings about the landscape of our rejected things,” said Kastner when informed that she had been selected as the 2018 artist in residence. During her time at the college, Kastner will have her studio, located at the Haliburton campus, accessible to the public and plans to engage with the community on site at the landfill. A public lecture will be announced. Reclaim Artist Residency is a unique partnership between Fleming College and the Muncipality of Dysart et al. It is the only residency in the province that provides established artists with the opportunity to access and work within a municipal landfill, and in turn, educate the community on the impact of the landfill. Reclaim Artist Residency attracts artists seeking to create art that shares their knowledge, respect and understanding of recycling and waste management.